The softball team opened its season this weekend by taking second place at its own Country Inn & Suites Invitational with three wins and a loss. 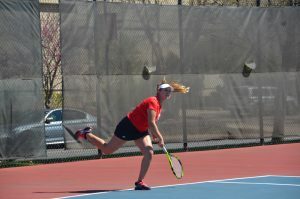 First-year head coach Amy Hayes said she was happy with the team’s effort and felt the Braves had made some big strides from where they were last fall. The Braves opened up play with a 5-2 victory over IUPUI and a 2-0 shutout of Wright State, a 2008 NCAA Tournament competitor. Senior pitcher Ashley Birdsong threw a two-hit complete game to grab the win against Wright State. Birdsong had nine strikeouts and no-hit the Raiders into the sixth inning before giving up a one-out bunt single. 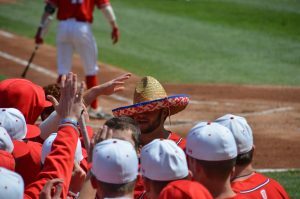 After the back-to-back wins, Bradley fell to the eventual tournament champion Iowa State Cyclones by a score of 5-3, after leading 3-1 through four innings. With Birdsong getting her second consecutive start, Iowa State threatened early, rattling off two quick singles to lead off the game. The Cyclones were only able to push one runner across the plate in the first inning, however, and Bradley answered back with two runs in the bottom of the second inning and another in the third behind RBIs from junior Janay Mitchell, freshman Julie Sherman and senior Alicia Bachkora. Iowa State rallied back to take the lead in their half of the fifth with three runs, and added one more in the sixth to put the Braves away. Birdsong (1-1) tossed her second complete game in as many days in the loss to the Cyclones, giving up nine hits and striking out 10. 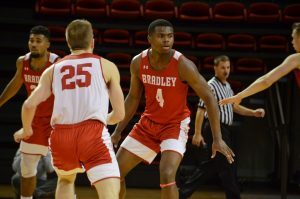 Bradley rebounded immediately from the Iowa State loss with a 5-1 victory over Western Illinois in the next game of the tournament at Pekin’s Dragon Dome. The Braves received yet another complete game effort from its pitching staff, with Amanda Clack (1-0) going the distance and striking out six Leathernecks. Freshman Jackie Roth jump started the Bradley offense in the second inning, as she eventually came around to score after reaching base on a one-out single. Playing in her first collegiate action, Roth was the only player on the team to get a hit in each of the four games of the tournament. Roth started her Bradley career by hitting a team high .545 in the tournament with six hits and a pair of RBIs. Senior Miriam Wegmann and Mitchell each had two RBIs over the weekend, as well. Hayes said overall, she was pleased with the Braves’ showing in the Invitational. The Braves will be in action today, taking on South Carolina and Bowling Green at Central Florida’s Early Bird Tournament in Orlando.